Search engine optimization (SEO) for attorneys is very much a thing, as law firms are beginning to take advantage of SEO and keywords to create an online presence. Law firms are competitive these days, so when you begin to create an online presence for yours, you need to start being competitive at a local level. Using keywords related to your practice and where you are based out of will help achieve that higher search engine ranking; just make sure your keywords aren’t too broad. Once you achieve a strong local presence, you can optimize in order to target clients outside of your area. Along with localized keywords, it’s imperative that you also build your SEO presence via Google Places and other online business directories. This will help your business’ searchability, as well as provide potential clients with a map showing your business’ location. This is Google Places in action. And with people always looking for a law firm, you’re doubtlessly going to be seen. People are always searching for information. Your firm can sate this thirst by including a page covering frequently asked questions. And it’s not just about answering queries; you can provide explanations for legal jargon and showcase studies that display your firm’s expertise. This informative experience will make your firm appear qualified to handle a multitude of situations. From a marketing perspective, enticing content is a necessity. Moreover, you need to have calls-to-action that include contact information. It’s important that you select only those calls-to-action you want and not ones selected randomly, as this risks your site being overloaded, lowering traffic conversion rates. Knowledgeable about family law? Have some insight regarding security regulations? This is all valuable information and can easily be used as blog content. A regular blog of quality legal content will attract interested parties; a wider audience can be reached by providing it through an RSS feed. 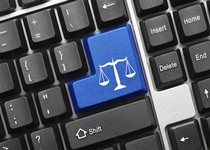 Attorneys have an advantage when it comes to SEO. That’s because they get to learn a lot and are exposed to a massive amount of information in the process; as a result, they have a ton of knowledge they can use on their blogs and web sites. SEO professionals have noted that many of the most successful online companies stay highly ranked and relevant by regularly updating their content. So even if you only update on a monthly or bi-monthly basis, it’s enough to continue to drive SEO traffic to your firm’s site. Social media sites such as Facebook, LinkedIn and Tumblr serve as free outlets for you to post what’s happening in your firm, promotional videos, and other content marketing data. Many companies see their social media ranked higher than their web site’s landing pages, which means it’s vital that you keep and maintain a few social media sites for your firm and update them regularly with fresh content. Law firms aren’t much different than any other local business, which means, like local businesses, they need to use SEO if they want a chance at success. Using SEO will provide law firms with a group of marketing outlets that can continually attract viable business opportunities.